When closet space is limited and there is just no more space for a set of drawers, the best storage bed will provide you with plenty more room that is otherwise being left unused. 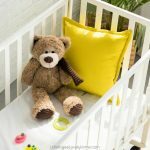 The best storage beds come in a range of modern and contemporary designs and will help you organize your things so simply that you will be kicking yourself for not getting one of these baby’s years ago! 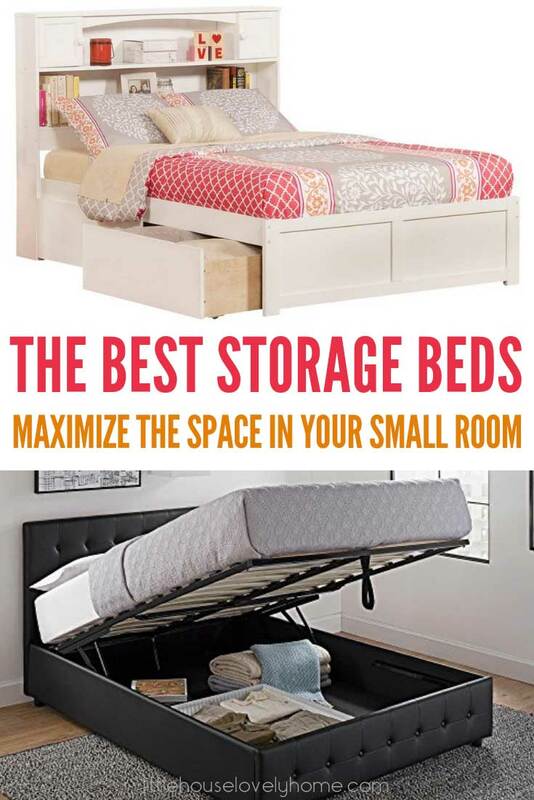 If you are on the hunt for the ultimate storage bed, then you are in the right place my friend, because in this guide I am going to take you through everything you need to know about buying a modern storage bed. We will check out the various storage bed designs, what you need to consider about your own individual circumstances, followed by a closer look at some of the best storage beds for sale right now. 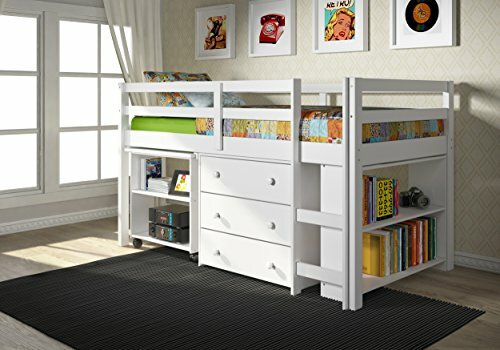 Whether you are looking for the best king size bed with storage, the best queen storage bed, or the best twin bed with storage for your child’s bedroom, I have no doubt you will find what you’re looking for right here in these storage bed reviews. 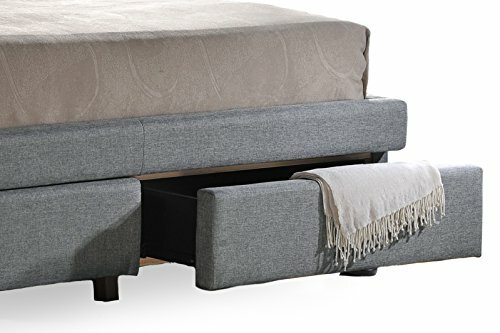 Quite simply a storage bed is a bed with storage underneath. The storage compartments are built into the frame of the bed either in the form of drawers or a large open box type space. You are making use of space that is otherwise absolutely wasted! Sure, some people store crates with stuff under their beds, but you rarely make use of the entire space, not to mention what a nightmare it is crawling under the bed to find that one crate you’re after. You can store things under the guest bed and no one will even know! No more concerns about your mother in law opening the guest bedroom wardrobe revealing a mess! If you live in a climate with multiple distinct seasons, you can store away your clothes after each season and only leave out the clothes you need. If you have a super small room or just prefer the minimalist look, you can store your things under your bed without the need to have a set of drawers. There are two main types of storage beds: beds with storage drawers or a lift up storage bed. This is the most common type of under bed storage. 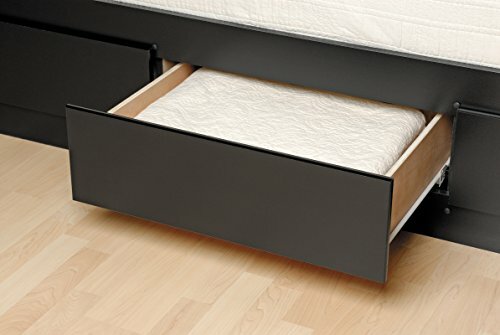 Under bed storage drawers can either be at the side of the bed, at the end of the bed, or a combination of both. The important thing to remember with a bed with drawers underneath is that you will need enough space surrounding the bed, to allow the drawers to fully extend. In some cases, there may not be enough room, or perhaps there is enough room at the end of the bed, or to one side of the bed and therefore you can look for a bed base with drawers configured in such a way to suit your bedroom. These days, beds with drawers under them come in a wide range of modern and contemporary looks from upholstery, faux leather to wood, so you can easily find something to suit your bedroom décor. The other type of bed with storage is a lift storage bed. These types of storage beds come either as a hinged frame or a hydraulic storage bed. 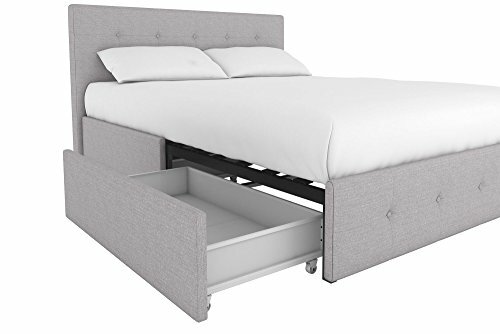 The storage beds with a hinged frame, also sometimes referred to as box storage bed, require you to hold up one side of the bed whilst you access your items. These types of storage beds are better suited for storing items that you only need occasionally, rather than every day. A hydraulic bed frame sometimes referred to as a flip-up storage bed or a pivot storage bed frame, is powered by gas lift where the base under the mattress lifts. 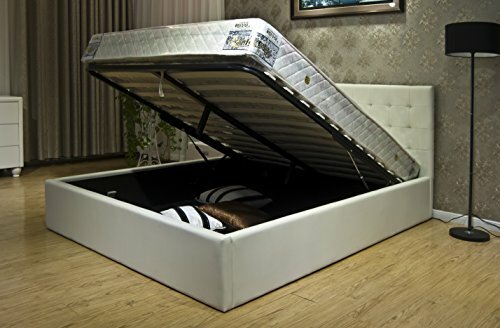 This allows you to store your things in the wide open space directly under the mattress. 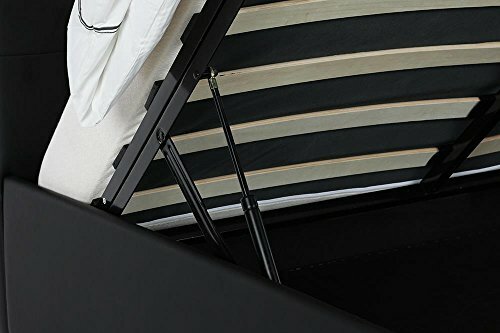 The great thing about a pull-up storage bed is that you don’t need any additional space surrounding the bed as the bed opens straight up towards the ceiling. Don’t have time to read my entire review? 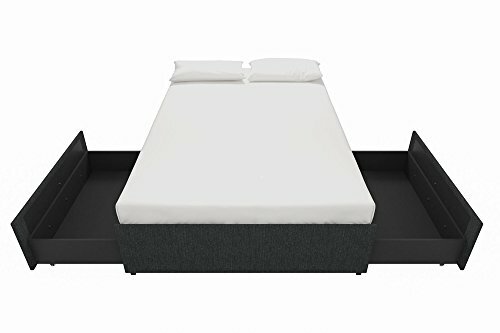 If you are looking for the best storage beds for small rooms, I recommend the Baxton Studio Ainge Contemporary Button. It not only has the looks, but it has the smarts, too! Click here to read more about it. I love this platform bed with drawers the best because it combines a stunning headboard with a functional bed frame. 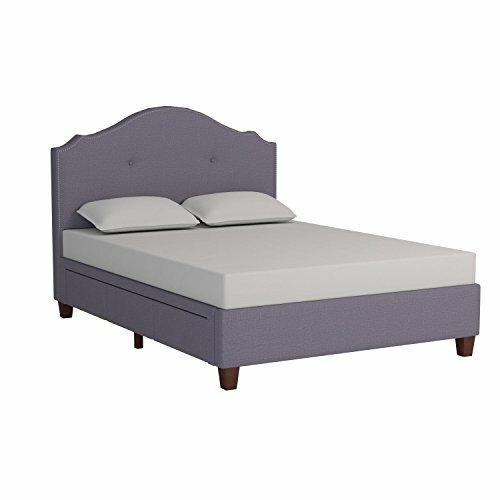 It also comes as a queen or king size bed frame with storage. It may not have the huge amount of storage drawers the Prepac Coal Harbor Mate’s Storage Bed (which has six drawers! ), or the affordable price tag of the DHP Maven, but it is a well-designed, beautiful piece of bed furniture with storage that will make any room look sophisticated. 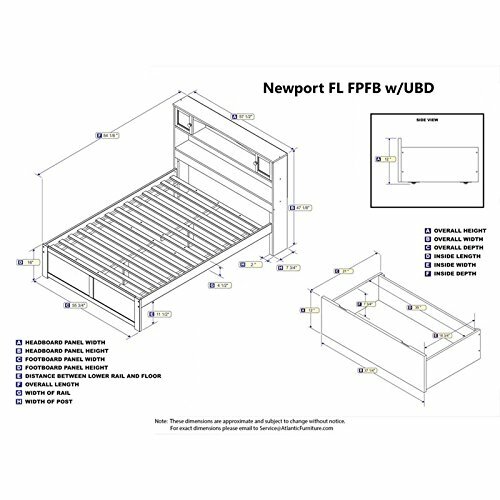 Below is a quick comparison table of all the best bed frames with storage in this guide. 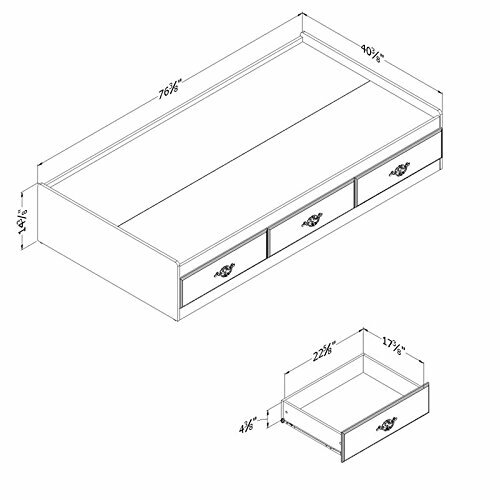 Keep reading below for a more detailed look at each contemporary storage bed. 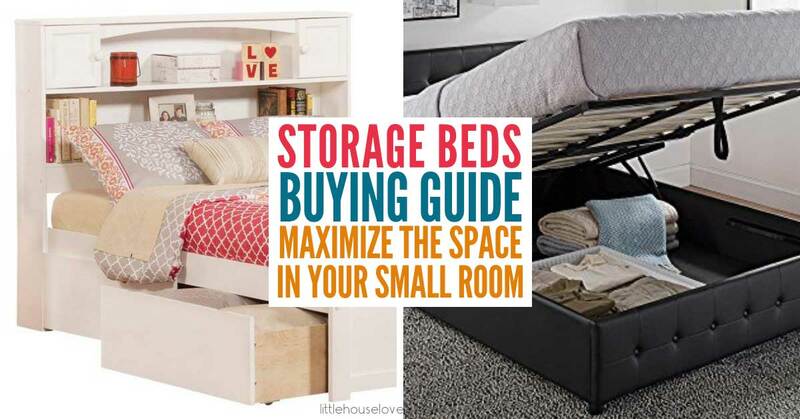 Before purchasing a bed with storage under it, consider the following factors. To choose between a bed with drawers under it or a hydraulic storage bed you will need to consider the available space you have around the bed. Before purchasing your king, queen or full-size bed with storage, measure the space where the bed will go. Large drawers will need quite a lot of additional space to open right up. Perhaps you have enough space at the end of the bed, but not the side of the bed, or on one side of the bed there is ample room to accommodate drawers but not the other side. Beds with drawers underneath them come in a variety of combinations, so you should be able to find a bed with built-in drawers configured to suit your bedroom. If your room is extremely small and there is just no space to accommodate drawers, you will need to consider a hydraulic lift storage bed. A hydraulic bed does not require any additional space at all and so is the perfect choice where space is at an absolute premium. However, if you’re considering a hydraulic bed, be sure to check for low hanging lights. It is also important to consider what it is what you want to store. Will you be storing clothes that you require daily access to? Or will you be storing items that are seasonal and only require access once or twice a year? A bed stand with drawers is much practical if you need to access your items daily. 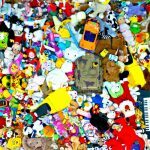 You will also need to consider the size of the items you are storing. Clothing items are well suited to drawers whereas larger items like bags or sporting equipment will require a larger space. Also, if you are planning on storing your clothes, you may prefer smaller drawers or drawers with partitions to keep your items neat and organized. Beds with built-in storage do have a weight restriction so be sure to check how much weight your bed can hold. Regardless of whether you purchase a bed frame with built-in drawers or a lift up bed you want to ensure that it functions as it is supposed to. I highly recommend spending time reading various platform bed with storage drawers reviews as well as hydraulic lift bed storage reviews and see what other customers are saying. You will soon discover if there is a design issue with any particular bed. Of course, you also want one of the modern bed designs with storage that look fantastic and stylish. These days there is plenty of choice when it comes to quality storage beds, and you will be able to purchase a great bed in a range of colors and styles that will go perfectly with your décor. DHP are well known as the small space living experts so there is no surprise that there are three of their beds in these reviews. First up, for the ultimate upholstered storage bed, you can’t go past the DHP Cambridge Upholstered Faux Leather Storage bed. 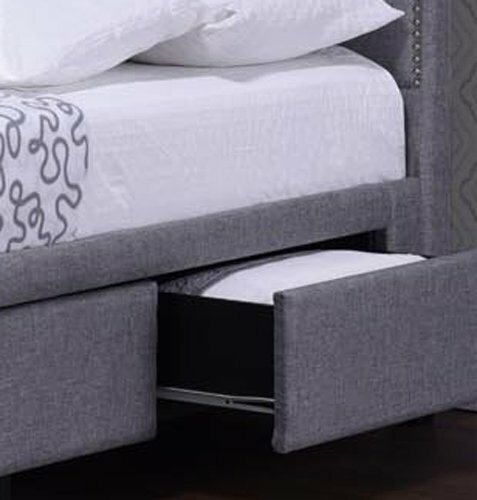 This bed with underbed storage is a modern-day hydraulic bed offering the perfect storage solution for people living in apartments or just a tiny bedroom. Using a gas lift mechanism, the base opens with ease, revealing a massive area for you to store your belongings. Not only is this bed an absolute lifesaver when it comes to storage, it looks fantastic too. This bed frame with storage and headboard is available in both a black faux leather or a grey linen, this will look gorgeous in a range of bedrooms. Reading any DHP gas lift review, you will see customers loving the look of this bed. This is the perfect space saver bed and ideal for anyone looking for the best double bed with storage or queen size bed with storage drawers. You can also buy with confidence as this bed comes with a one year warranty. The Greatime BS111-2 is a stylish and functional hydraulic platform bed with storage, powered by a gas-lift system. 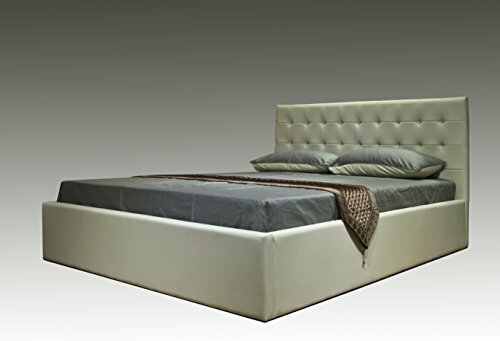 The high-quality leatherette covering, and sophisticated tufted headboard will help to jazz up any room décor. The secure under mattress storage space goes right to the floor (7.5 inches deep from the mattress base), making it ideal to store even the heaviest of items. The gas-lift system makes accessing this large storage area a total breeze. 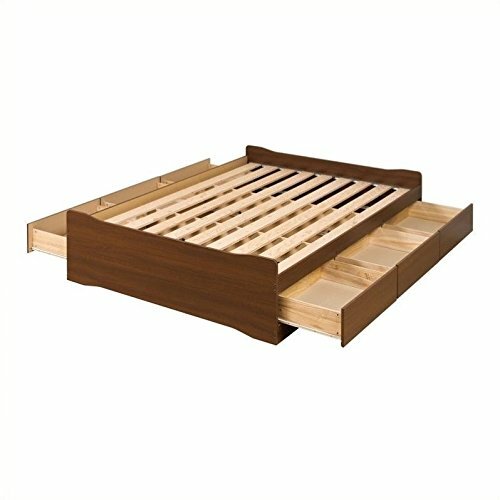 Available as a full, queen or king bed frame with storage, this sturdy, solid wood storage bed base will support your mattress with wooden slats, eliminating the need for a box spring. Although on the pricier side, hydraulic lift bed storage reviews say that this is one of the best king storage bed options on the market. Available in a white, brown or black leatherette, it is an extremely functional piece of furniture that also looks fantastic. 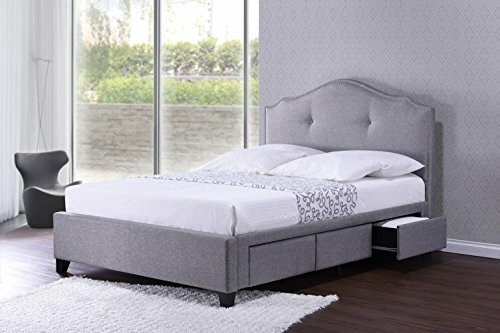 The DHP Rose Upholstered Platform Bed with Under Bed Storage is the second of the DHP stylish storage beds in this review. 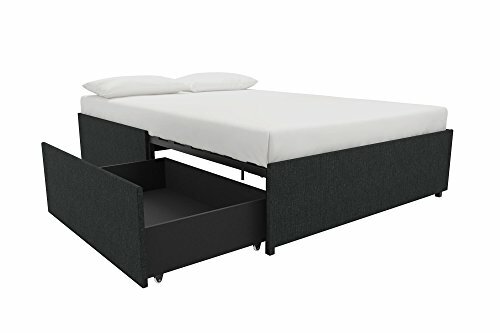 The price of this DHP bed makes it one of the best platform beds with storage available. 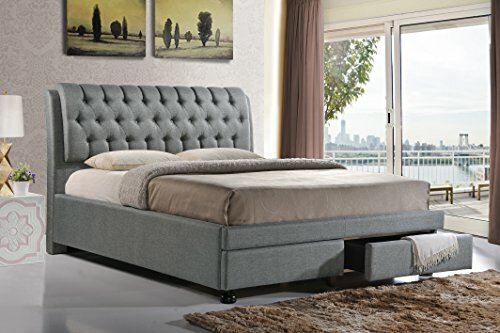 This linen upholstered bed with storage drawers has button-tufted details in foam padding in the headboard and footboard, giving the king size bed with drawers a modern, mid-century look. 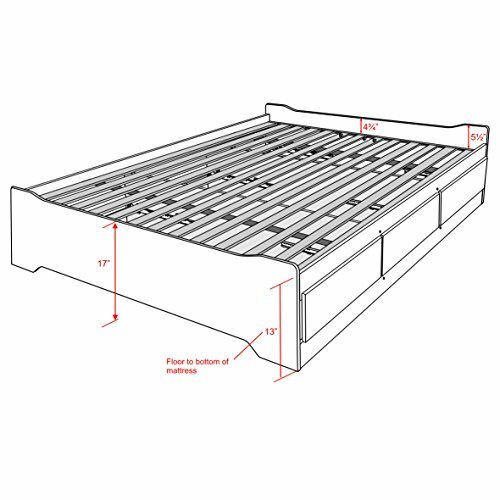 The bentwood slat support system provides ventilation to keep your mattress fresh and does not require any additional foundation, and the extra center legs add further support for peace of mind. The drawers have a locking mechanism which is handy if you have small children that like to open anything they can get their hands on! The number of drawers provided depends on the size of the bed – twin size has two drawers, while the full, queen and king size have four drawers (two on either side). This extra storage space makes this bed frame with drawers and headboard one of the top beds on offer. The Baxton Studio Armeena Linen Modern Storage Bed is a beautiful modern full storage bed with headboard. The scalloped headboard with silver nail head trim makes this platform storage bed really stand out from the rest! The wooden frame with foam padding is upholstered with your choice of beige or grey linen, with black wood legs completing the glamorous look. The right side of the bed has three small drawers with upholstered fronts and wooden interiors, providing enough space for your bed linens or shoe collection. 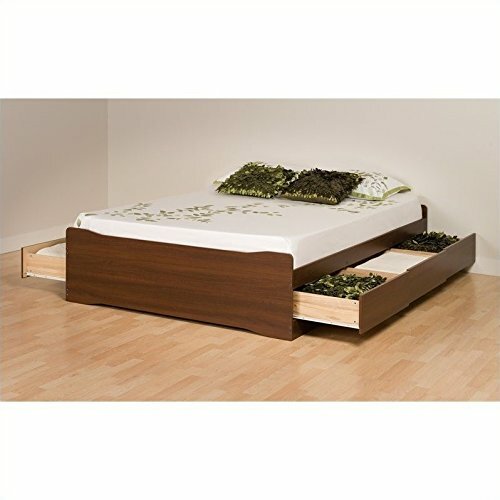 This king or queen platform bed with storage, has drawers that are on tracks, which makes for easy accessibility. Wooden slats allow the mattress to breathe while still offering great support. Available in two sizes, this queen or king platform bed with storage will add a little bit of luxury to your bedroom without the hefty price tag. 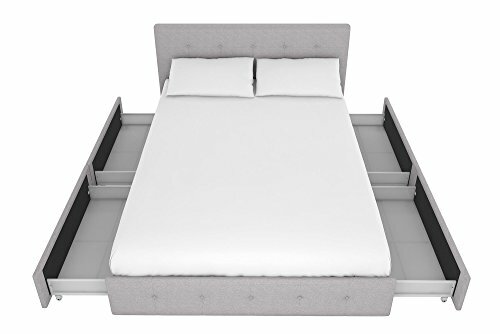 The Baxton Studio Armeena Modern Storage Bed is one of the top-rated platform beds with storage underneath in this review – customers absolutely love it! Another beautifully designed modern bed with lots of storage, the Baston Studio Ainge Contemporary Button platform bed combines fashion and function. The light beige or grey fabric covered frame and foam padded, upholstered headboard with button tufting exudes style and elegance. 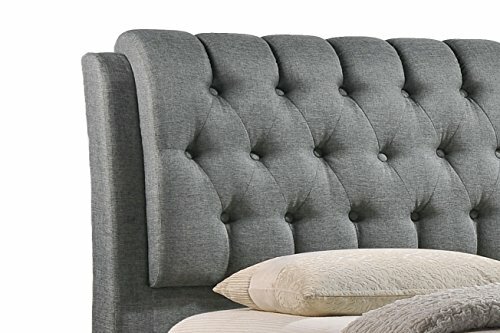 The padded headboard doubles as a comfortable backrest, which is great when you want to sit up to work or watch TV in bed. At the foot of this queen or king storage bed are two large pull-out storage drawers, allowing you to store your quilts and pillows, or your out of season clothing. The hardwood and plywood frame with MDF LVL slats have the added support of a central beam, making a box spring unnecessary. If you are looking for a queen bed with storage drawers underneath or a king bed with drawers in a neutral design that will suit any bedroom décor, the Baxton Studio Ainge is the bed for you. The pick of the bunch for cheaper, affordable storage beds, is the DHP Maven Platform Bed. Not many cheap bed frames with storage tick all the boxes, but the DHP Maven does. 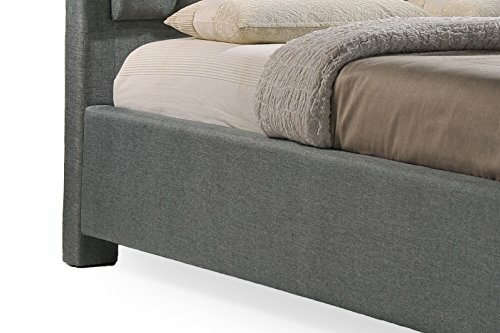 With clean lines and a modern low-profile design, this storage bed without headboard is well worth the price. 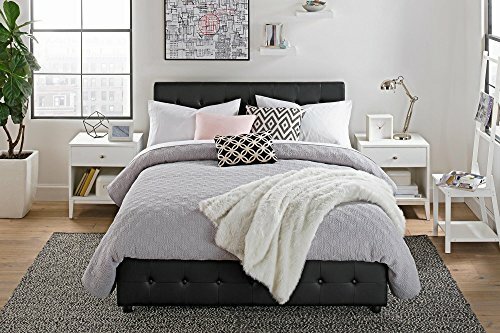 Available in your choice of grey linen, or black or white faux leather, this twin or queen size bed frame with storage bed is fully upholstered, even inside the two large roller drawers! There is plenty of room to pack away your bedding, seasonal clothing or whatever else you like! You can expect outstanding back support with excellent pressure distribution due to the Bentwood slat system. This slat system also makes it possible for air to circulate all around the mattress, which in turn keeps your mattress fresher. The metal side and center rails, along with the center leg add to the bed’s support and means that no box spring is required. 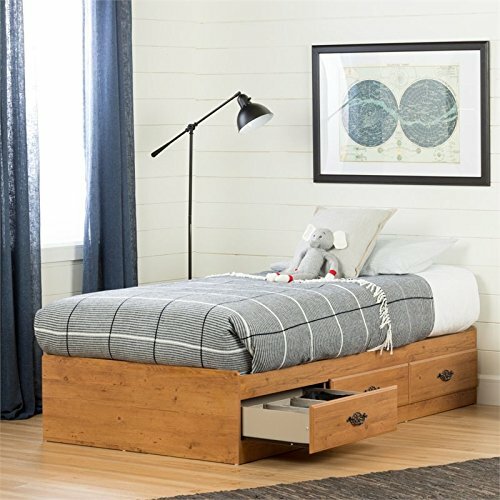 This platform bed frame with storage is easy to assemble and available in twin or queen sizing, the elegant and contemporary styling of the DHP Maven makes it the perfect platform bed frame with drawers underneath. Now, this queen size platform bed with storage really gives you bang for your buck! 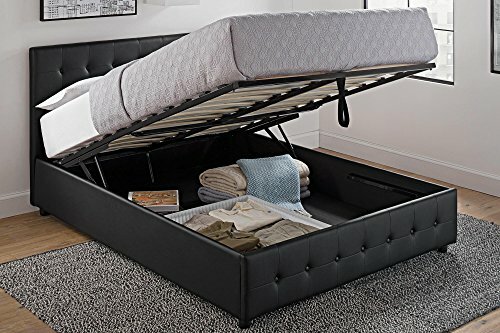 You could store your entire wardrobe in the base of this storage bed! The Prepac Coal Harbour Mates Storage Bed features a huge amount of storage space with six 18” deep drawers (three per side). These sturdy drawers have finger pulls at the bottom of the drawers for easy opening, and glide on metal runners with built-in safety stops. The wooden slat support system means you don’t need a box spring due to the slats running lengthwise instead of crosswise. This queen bed frame with drawers is made from composite wood with metal supports and is covered in a melamine laminate in your choice of espresso, black or warm cherry. And if you’re wanting a complete the bedroom set with a matching headboard or dresser, the furniture in the Coal Harbor Bedroom Collection has got you covered. 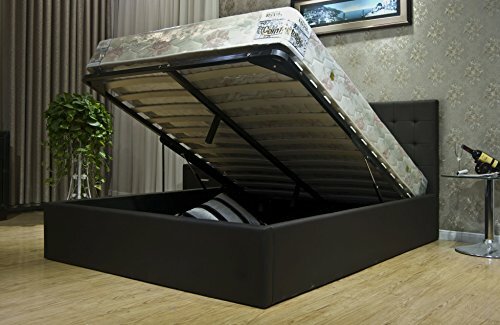 If you are looking for a versatile and affordable queen size storage bed base only with heaps of storage space, the Prepac Coal Harbour Mates Storage Bed may be the one you have been looking for. 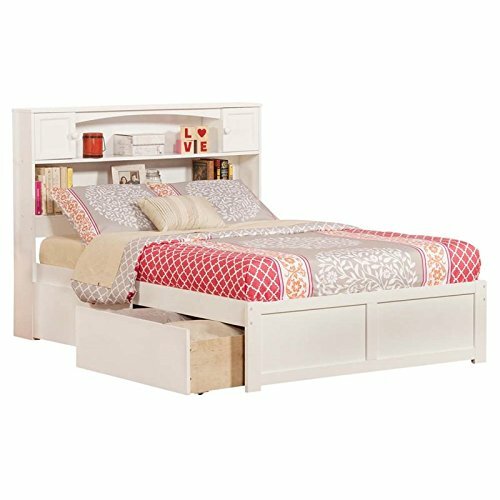 Listed as ‘Amazon’s Choice’ for twin bed storage, the South Shore Prairie Twin Bed with Storage is one of the best value kids beds with storage. Three spacious drawers provide plenty of storage – and the bonus is that they can go on either side of the bed! The single bed with storage frame is made from pressed particle board and is covered with a natural country pine paper laminate. 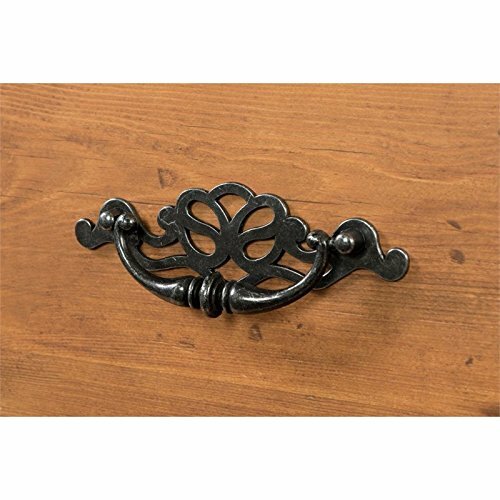 The antique-style pewter metal drawer handles add a nice rustic touch and some country charm. For an inexpensive, matching solution for a child’s room, the matching bookcase headboard and night table (sold separately) are perfect. And you can buy without worrying about the quality – this single bed with drawers comes with a 5-year limited warranty. This is one of the children’s beds with storage is designed to grow with the child through to teen years and into young adulthood. 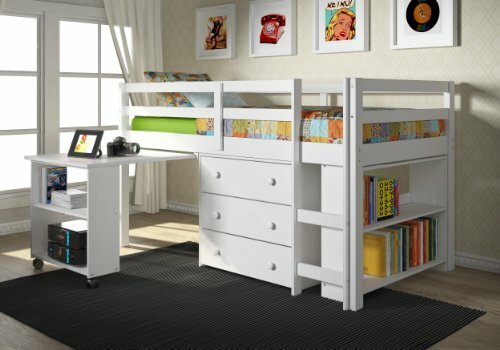 The Donco Kids 760-W Low Study Bed is the king of children’s space-saving beds! It incorporates a twin size loft bed, a bookshelf, a three-drawer chest, and a roll-out desk all into the one space. If you are looking for a great twin bed with drawers underneath for your child, look no further! The solid pine single bed frame with storage comes in your choice of cappuccino or white finish and will look good in any room. The bookshelf and chest are freestanding, meaning that they can be pulled out and placed around the room, while the desk is attached to the bed frame. This is a bed with a lot of storage! And the kids will love the little hideout area under the desk! The loft bed base comes with a slat roll and is mattress ready, and has a guard on all sides, making it safe for kids that like to roll around in their sleep. The height of the bed is perfect for parents tucking their children in and reading them bedtime stories. This is the ultimate of cool beds with storage and easily one of the best single beds with storage. I wish I had one of these when I was a kid! Last but not least is the Atlantic Furniture Newport bed. This is available as a twin, XL twin or double bed with storage and is made from solid hardwood, hence the high price. It is one of the durable wooden bed frames with storage suitable for all ages with two drawers underneath, so you can rest easy without the clutter. Available in three colors – espresso, walnut and white – this single bed with storage underneath has a headboard featuring two compartments behind raised panel doors and built-in shelves. The drawers are on wheels, not tracks, and can be installed on either side of the bed. There is no panel to cover up any gaps where there are no drawers, but you can order additional drawers from the manufacturer. You can also complete the look with a matching nightstand and 5 or 6 drawer dresser (sold separately). 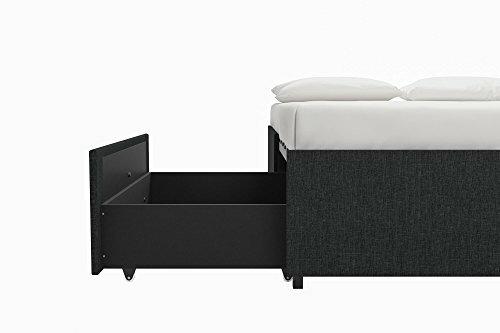 A few reviews of this single bed with storage drawers mention that the assembly of the beds can be difficult, and this one is no different. That being said, a lot of reviewers were happy with the bed once it is assembled. 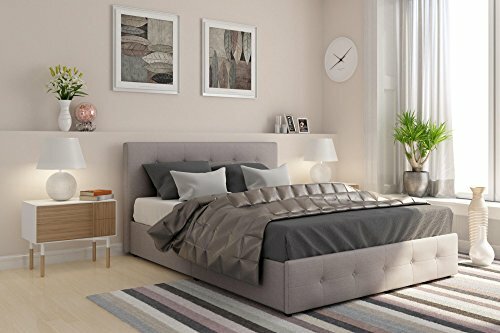 If you are looking for a lovely twin storage bed with headboard or a boys or girls bed with storage, this would be suitable, but if you are concerned with being able to put it together yourself you want to keep looking. I really hope you’ve found this review of the various storage beds available helpful. 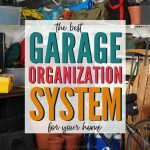 If you liked this, check out my guide to garage storage.